Quality has always been the cornerstone of our approach to business. 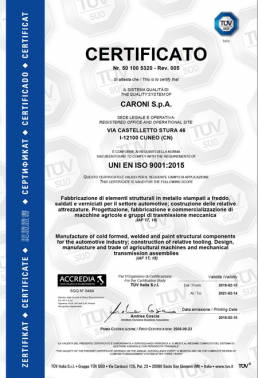 An in-house Engineering Office, a Prototyping Department, various test centers and CNC measurement systems complete Caroni’s quality profile, and allowed the company to obtain ISO 9001 – VDA 6.1 certification as far back as 1994, followed in 1999 by ISO/TS 16949 certification by the TÜV Management Service, one of Europe’s strictest certification authorities. The Caroni S.p.A. Quality System has been in operation for many years now, guaranteeing excellent results through application of strict control procedures at all stages in the company’s processes: tangible results which have earned Caroni the trust of the world’s most important markets and long-term contracts with major automobile manufacturers. Reliability, credibility, integrity are the fundamental principles to which we conform our daily actions and according to which we commit ourselves to operate to the maximum of our possibilities and capabilities. This is why we wanted to put our Code of Ethics in paper. In fact, our Ethical Code defines rights, duties and moral responsibilities to which all members of the company organization must conform their behavior – both reciprocal and external – to safeguard respectability, reputation and integrity of everyone and of the Company. It is based on solid shared values of honesty, loyalty, fairness, respect for people, rules and the environment, commitment and collaboration in the pursuit of business objectives, so that the company’s business is carried out according to best practices. Also with regard to the environmental management system, the code is aimed at guaranteeing the prevention of pollution and the achievement of environmental objectives and targets apt to achieve a continuous improvement of its environmental performance in the most scrupulous respect of the obligations imposed by the legislation on this subject. The compliance of the behaviors to the Code therefore represents a guarantee for all the acttors directly or indirectly involved in the company’s activity: customers, suppliers, partners, citizens, employees, collaborators, public institutions, environmental associations and anyone else involved for whatever reason in the activity of the company. Quality and the environment must be conceived as corporate values in which all reflect themselves, while the tools provided by the Management System must be seen as a support to improve their work. In order the Integrated Management System ensure maximum added value to business processes, it must guarantee the improvement of methodologies and technologies, the revaluation of human resources, the acquisition of the most appropriate technical knowledge, the accurate management of information on the results achieved and the minimization of direct and indirect environmental impacts. 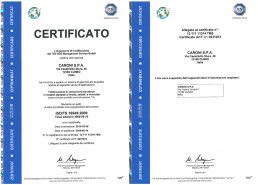 CARONI S.p.A. adopts the philosophy of continuous improvement, exploiting all the indications obtained from the systematic detection of its weak points. The documented information related to the CARONI S.p.A. processes, and their planning and control as a management tool for every business activity, are the reference points of the Integrated Management System. Our founding values are the dedication to the client and to the interested parties, professional excellence, reliability of products and services offered, transparency, correctness, innovation, creativity and attention to the environment. Ensuring the evolution of the services offered to customers while ensuring the maintenance of the high level of reliability achieved. Maintaining the high quality standards that CARONI products have achieved with full customers satisfaction. Demonstrating availability, managing customer requests competently and using all the tools necessary to expand the number of those who rely on CARONI S.p.A. for the solution of their needs. Periodically analyzing the environmental aspects related to the activities carried out, evaluating the relative impacts taking into account the context of the ecosystem and the requests from the interested parties. Communicating the principles of environmental sustainability to suppliers, customers and stakeholders that are relevant to the environmental management system. Establishing environmental objectives taking into account the knowledge of the context and the environmental impacts of the activity carried out. The operational management of CARONI S.p.A. has the direct responsibility of the Management System, assumes the commitment to periodically fix the concrete and reachable objectives indicated in the document “Management Review”, to make available all the resources (human, technical and financial) necessary for the pursuit of the aforementioned objectives and to verify their achievement through the system review tool. It is ensured that the client’s needs and expectations are clear in the processes in place and that his degree of satisfaction with the products / services provided to him is detectable. 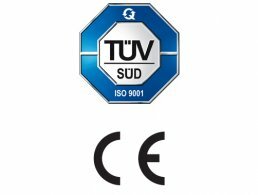 A constant monitoring of the quality of the products marketed is ensured, through verification actions in the main phases of the design, and systematically, on each product produced, at the end of the production cycles. The management of CARONI S.p.A. undertakes to ensure that the guidelines outlined here are disseminated and assimilated by all the personnel operating at any level using the company website and all the internal communication tools activated and by all relevant stakeholders. Every person working within CARONI S.p.A. is called to take active part in the commitment arising from this policy: awareness and sense of responsibility of everybody must always be nourished by the certainty of obtaining a constant optimization of their performance. From this policy arise specific objectives, which are reviewed periodically, in the context of the Management Review.